While Prosecutor Mackie’s decision effectively foreclosed the option of prosecuting Ried for killing Rosser, the circumstances of her death raises questions about the relationship between mental illness, race, and policing in Ann Arbor: what is the police protocol for handling crises when someone living with mental illness is involved? Are police trained to do so? Rosser’s, Ford’s, McKenna’s, and others’ deaths raise larger policy and scholarly questions for policymakers, scholars of mental health, policing and mass incarceration, and activists who care about these issues: Why are police officers put in position to intervene in medical and domestic crises without the assistance of psychologists and social workers? Should the police be the first responders? The most important questions for scholars, policymakers, and activists is: How did we arrive at the point where police intervention in medical crises, especially for African Americans, becomes a life or death situation? What policies have produced Aura Rossers? What system produces Ezell Fords? Journalist Harry Cheadle reports that the asylum population in the U.S. declined from 558,000 in 1955 to 45,000 in recent years. Several factors contributed to the decline of mental health institutions in the U.S. Pharmaceutical companies produced new psychotic drugs that allowed the mentally disabled to treat themselves outside of the asylum. The disabled secured the right to decline institutionalization, with the exception of those suffering from extreme cases of mental illness. Harmful transformations in politics and the economy also forced the closing of asylums and clinics. 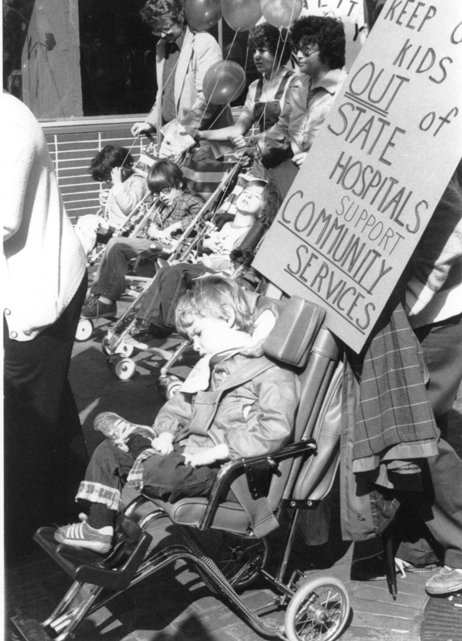 Fiscal crises forced state governments to slash funding for mental health institutions during the 1970s. President Ronald Reagan’s policies did little to address the mentally disabled and deinstitutionalization. In 1981, Reagan abolished the Mental Health Systems Act signed by President Carter. The MHSA provided federal funding for community mental health institutions. Reagan’s legislation established block grants for states. According to Kristin Brooks Hope Center (KBHC), a suicide prevention organization, Reagan’s repeal amounted to a 30 percent cut in federal funding. The decline in federal funding and continued closing of mental health institutions helped feed other social problems such as homelessness. More Americans living with mental illness also entered into the criminal justice system. Mother Jones’s Deanna Pan reports that by 1984, 30 percent of the prison population suffered from mental illness. Much has been discussed about the transformations of policing in the United States since the mid-1960s. Many observers, policymakers, activists, and scholars view police killings in the historical context of the criminalization of blackness (and more specifically in Rosser’s case, black womanhood) and poverty, militarization of police forces, and stop and frisk. Yet, fewer have discussed the historical impact of deinstitutionalization and how transformations in public policy around issues of mental health may also be part of the legacy of the carceral state. Aura Rosser and Ezell Ford remain deadly reminders of this intersection/legacy. Yet, as Watson and Fulambarker argue, CIT is only a “front door” solution. CIT is limiting and a short term solution. Rightfully calling crisis intervention training a “band-aid” fix, disability rights activist Leah Harris argues that police would be prudent to develop “trauma-informed” tactics as well. Harris argues such an approach would pay attention to not just the trauma that accompanies police interactions, but the trauma that is produced by systemic racism, classism, sexism, and what she calls mentalism. While Harris fails to offer a concrete model that incorporates trauma, her insights regarding trauma-informed policing are consistent with scholars Amanda Geller’s, Jeffrey Fagan’s, Tom Tyler’s, and Bruce G. Link’s conclusions in their study on the effect that policing has on young urban men’s mental health. According to their 2014 study, “participants who reported more police contact also reported more trauma and anxiety symptoms.” They concluded that young black men who were subjected to personally invasive policing such as stop and frisk experienced more “emotional trauma” and that they could “trigger stigma and stress responses and depressive symptoms.”7 Essentially, the policing that young black and brown men had to experience while living in a racist society not only traumatized them, but could also negatively affect their mental health. It has become obvious to many scholars and activists that it is necessary to confront the criminalization of blackness and poverty to address the racialized caste system that is embedded in the new Jim Crow. However, scholars, activists, and policymakers can no longer afford to just concentrate on race and class if they hope to prevent more police-related deaths among African Americans and other people of color. Disability and sexuality require attention as well. We should question the normative assumptions governing our perceptions of those diagnosed with mental illness as the “other.”8 Decentering normative understandings about ability, race, gender, sexuality, and class may lead to the conception of a more humane protocol when dealing medical and/or domestic crises in both the short and long term. Ta-Nehisi Coates is right — Americans cannot expect police officers to address larger social problems. Americans cannot ask police departments to be the only institution to shoulder the burden of confronting structural racism, sexism, and mentalism and the decline of the welfare state. But we must keep in mind that reforming police tactics could help save lives in the short term, even if the long-term goal is dismantling the system of policing and mass incarceration that has wreaked havoc on people of color and cities since the 1960s. Ben-Moshe, Liat, Chris Chapman, and Allison C. Carey. Disability Incarcerated: Imprisonment and Disability in the United States and Canada. New York: Palgrave Macmillian, 2014. Human Rights Watch, Ill-Equipped: U.S. Prisons and Offenders with Mental Illness. New York: Human Rights Watch, 2003. Thompson, Heather Ann. “Why Mass Incarceration Matters: Rethinking Crisis, Decline, and Transformation in American History,” The Journal of American History, Vol. 97, No. 3. (2010): 703-734. Brian L. Mackie and Steven Hiller, Memo to D/Sgt. Christopher Corriveau, January 30, 2015. The memo is included in the news story, “Read prosecutor’s 12-page memo on fatal Ann Arbor police shooting,” Mlive.com, accessed 15 May 2015. Return to text. Anonymous, People’s Retort to the Prosecutor’s Report, 6. For a digital copy of the pamphlet, go to radicalwashtenaw.org. Return to text. See Khalil G. Muhammad’s The Condemnation of Blackness: Race, Crime, and the Making of Modern Urban America (Cambridge, Mass: Harvard University Press, 2011) and Michael W. Flamm’s Law and Order: Street Crime, Civil Unrest, and the Crisis of Liberalism in the 1960s (New York: Columbia University Press, 2005). Return to text. Amy C. Watson and Anjali J. Fulambarker, “The Crisis Intervention Team Model of Police Response to Mental Health Crises: A Primer for Mental Health Practitioners,” Best Practice Ment Health, Vol. 8, No. 2 (December 2012), 1.Return to text. George Fachner and Stephen Carter, An Assessment of Deadly Force in the Philadelphia Police Department, (Washington, DC. : Office of Community Oriented Policing Services, 2015), 79. Return to text. Watson and Fulambarker, 1. Return to text. Amanda Geller, Jeffrey Fagan, Tom Tyler, and Bruce G. Link, “Aggressive Policing and the Mental Health of Young Urban Men,” American Journal of Public Health, Vol. 104, No. 12 (December 2014), 2321. Return to text. See Nirmala Erevelles’s “Crippin’ Jim Crow: Disability, Dis-Location, and the School-to-Prison Pipeline,” for an example of this type of work in Disability Incarcerated: Imprisonment and Disability in the United States and Canada, eds. Liat Ben-Moshe, Chris Chapman, and Allison C. Carey (New York: Palgrave Macmillan, 2014). Return to text.